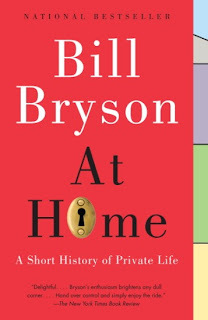 Bill Bryson Book Tour ~ Learn, Live, and Explore! One of my favorite authors is a very entertaining man whose work ranges from chronicling his crazy adventures in Australia or hiking the Appalachian Trail, to telling funny stories about growing up in the 1950s, or to describing a Short History of Nearly Everything. In his latest book, At Home, he conformed to his wife's wishes, literally, and finally wrote a book from home, about the home - a room-by-room history. But this post is not about how great Bill Bryson is as an author, in my opinion. It's about spending a night hearing him tell some of his stories, amuse the crowd with some of his favorite excerpts, and answer a few questions about his inspirations and his writing styles. Then, at the end, it's getting the opportunity to meet him and get my book signed as a memento from the evening. The key to all of this happening is the Sixth & I Synagogue in Washington D.C. While this synagogue is still an active place of worship, over the past few years it has gained a new reputation as a cultural center. Every month the synagogue hosts many speakers, authors, politicians, and musicians. I've had the privilege of seeing another favorite author, A.J. Jacobs, as well as Demitri Martin and Ashley Judd as they stopped in D.C. on their book tours. I love reading, but getting the opportunity to listen to the author as they speak of their motivations, inspirations, frustrations, etc. while he/she created the book adds a whole other dimension to simply buying a book off the shelf. For me, I feel that this is more necessary now than before because I've become apt to remove the traditional, tactile experience of reading a physical book, turning each page, favoring the convenience of the downloaded electronic copy instead. A hint if you ever decide to attend an event at Sixth & I, get there when the doors open. Especially for sold out events. The book signing process is lengthy, and people are called to line up based on their arrival times. In the case of tonight, the event was sponsored by Politics and Prose bookstore, another D.C. resource for author events; and, if you picked up your book copy and tickets in advance, those tickets actually had the lowest numbers and were called first. I've waited two hours in line before because I arrived right before the event started, so I had a horrible number! Also, if the author is popular, get ready to buy your tickets when they go on sale. 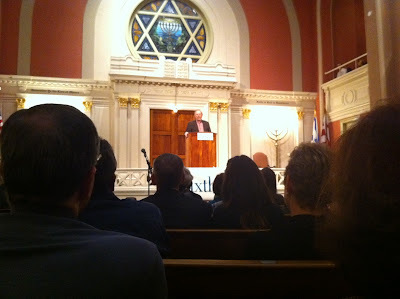 The synagogue is not large, so events sell out. In the case of Tina Fey this past spring, tickets sold out in minutes! I was not lucky that day.